The developers at Tap Tap Tap have released Camera+, a new all-in-one camera app with some unique features and a welcome dose of style. If you’re in the market for something better than Apple’s camera app, Camera+ looks like a worthy contender. Like any decent camera app should, Camera+ lets you shoot shoot photos, but you can also import any photos that you store in the Photos app. When shooting, Camera+ offers a few welcome tools like a grid overlay for lining up the perfect shot, as well as an image stabilizer option for ridding your precious memories of blurry moments. Camera+ also offers a bunch of editing features for touching up your shots. 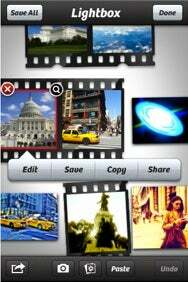 There are point-and-shoot camera “scene modes” that you can easily apply, like Scenery, Night, Sunset, and Text, and a wealth of effects and filters that are organized by category. A crop tool offers yet more quick-fix templates or a free-form option, and borders can add a little visual texture. The other big feature in Camera+ is a Lightbox where you can save your shots or even import existing shots that you already saved or synced to your iPhone’s built-in Photos app. This way you can work on your photos separately, or perhaps just move them into Camera+ altogether and clear out your Camera Roll (which is a good tip for speeding up your iTunes backups, by the way). Photos taken around the same time will be grouped in the Lightbox to keep things organized. Naturally, after you’ve crafted your perfect shots, Camera+ lets you share them via Twitter, Facebook, Flickr, and Mail. Camera+ is available now in the App Store at an introductory price of $3 (though the regular price is not mentioned), and it requires iPhone OS 3.1 or later.